I have spent HOURS trying to find an answer for this so PLEASE don't flame me if I missed it. I really tried! I have been using Evernote Premium on a Mac Retina 5k for a little over a year now and have noticed that recently it is auto-tagging one particular web-clipping. Not any others, just this one. I clip a lot of news articles, and for some reason, whenever I clip from the Washington Post, it auto-tags it for me! Which is AWESOME. But I can't figure out how to replicate it! I don't even know how it started! Can anyone tell me? Tagging is absolutely critical for my search in Evernote. 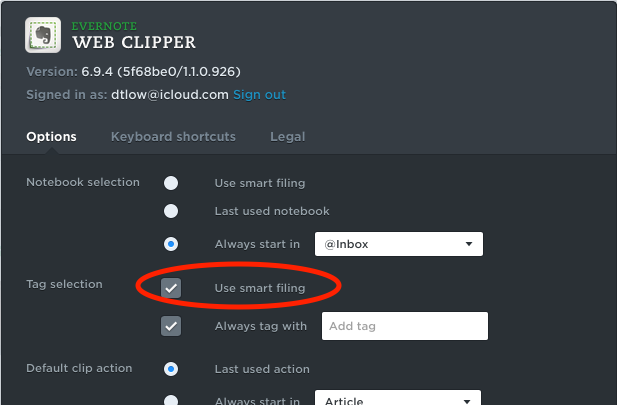 I tried the Smart Filing option, but it still required my review to ensure it was done correctly. After a couple weeks, I turned it off. THANK YOU! Now a new question... How do I get to that screen??? lol I just gave it a quick go but I'm not seeing it... Is it on-line or in my app? I don't see it in either. Sorry to be such an idiot. Oh! NEVER MIND!!!!!!!! Found it!!! Haha. Where do I find the options for the auto-tagging points listed by Al Sargent? I find notebooks created that I did not create. How is that possible? Evernote does not have "auto tagging rules"
There is a third-party product "Filterize" that implements auto-tagging for Evernote. >>I find notebooks created that I did not create. How is that possible?